The concept of pasalubong is a very endearing Filipino tradition. The closest translation might be “homecoming gift”, a small token to friends and loved ones by someone who has traveled upon coming home. A gesture of thoughtfulness and generosity, pasalubong could be anything from little souvenirs and keepsakes, to food items– usually snacks, sweets, and treats, mostly. As a relatively popular tourist destination, there are a lot of awesome pasalubong items you can get in Tagaytay to bring back home with you. Here are seven of the most popular pasalubong items visitors usually take home from Tagaytay. It’s likely the weather and the fertile soil. Tagaytay is a great place to go shopping for plants, particularly for culinary herbs, but you’ll also find succulents, florals, orchids, saplings, and other plants. Start out with herbs you think you’ll be using more (e.g. basil, cilantro, mint, oregano, etc.) and then build your collection from there! 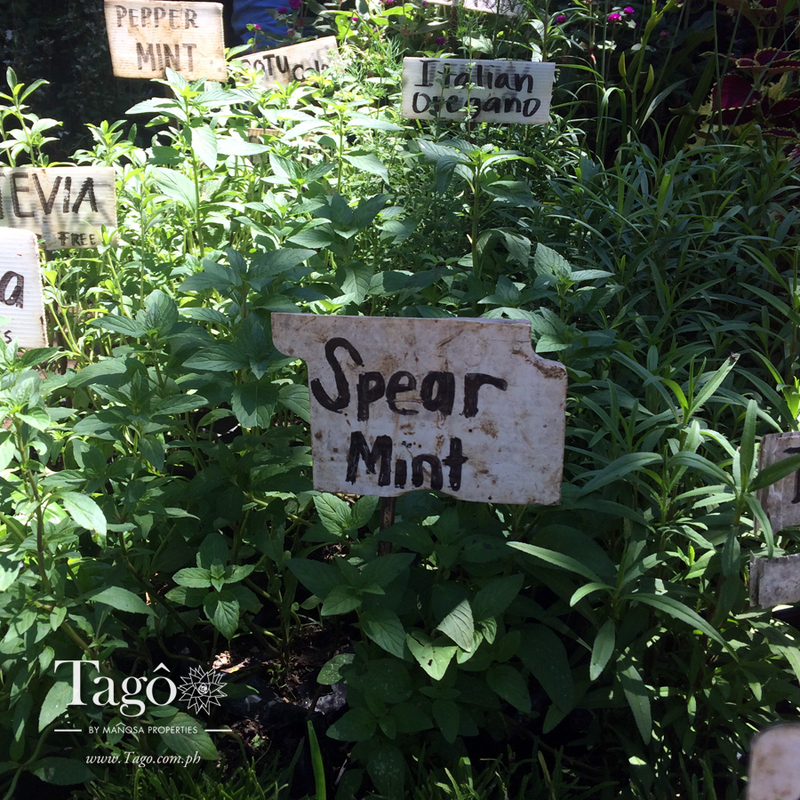 You can get a lot of culinary herbs just about anywhere in Tagaytay! Just about anywhere in Tagaytay– along the main roads, in malls, even restaurants and hotels sell some. Without having to go to out-of-the-way farms, best selection for the best price can be found at the Mahogany Market. Just head on to the back, towards the local LTO, and you’ll find a good number of vendors there. Yes, you can do some haggling too! You can also get some of those culinary herbs at Sonya’s Garden, sure. But lately, we can’t help but notice a lot of people coming to town just for their freshly-baked goodies at their panaderia. Sonya’s Garden has a variety of traditional Filipino breads and pastries constantly cranked out by the kitchen– kalihim, ogoy ogoy, putok, monay and adobini, among others. 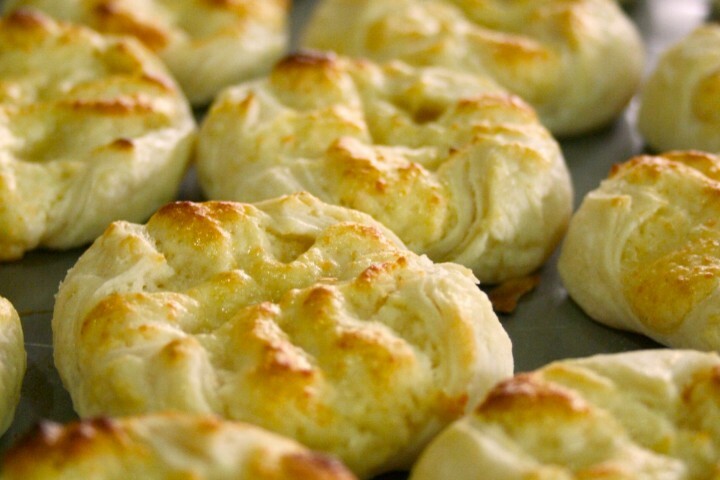 Our favorites though would have to be the Spanish bread, the bacon rolls, the butter cookies, and the cheese hopia! The one and only Sonya’s Garden is located at Buck Estate, in Alfonso, Cavite. It’s in-house bakery is conveniently located at the parking area. Don’t forget to head further into the grounds and check out the apothecary and the country store for other stuff they make and sell on-site. Visit the official website of Sonya’s Garden. 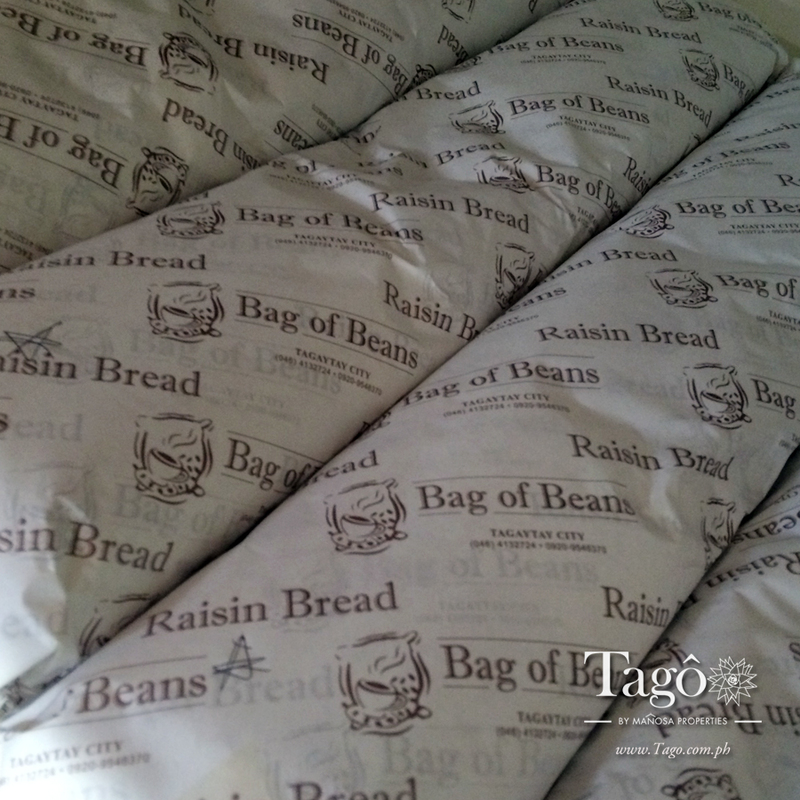 Speaking of bread, another popular pasalubong item is the raisin bread over at Bag of Beans. It’s choc-full of raisins, and goes very well with a piping hot mug of coffee! A lot of people compare it to the raisin bread they make at The Manor over at Camp John Hay in Baguio. The raisin bread over at Bag of Beans. Take some home and enjoy it on your next coffee break or merienda! If raisin bread isn’t your thing though, Bag of Beans is also known for its killer cheesecakes, so go treat yourself to a box, or just a slice or two! The main Bag of Beans branch is a little bit past Mendez Crossing (heading towards Batangas) along the Tagaytay-Nasugbu Highway. But you can also stop by any of their other three branches– you have one over at Twin Lakes (heading towards Batangas), another at Charito by Bag of Beans, and then you have the branch over at Silang Crossing West. Visit the Bag of Beans website. With several restaurant concepts under its brand, Antonio’s also has a line of food items you can bring home with you: salad dressings, bottled sardines, jams and jellies, and all sorts of sweets, treats, and baked goodies. 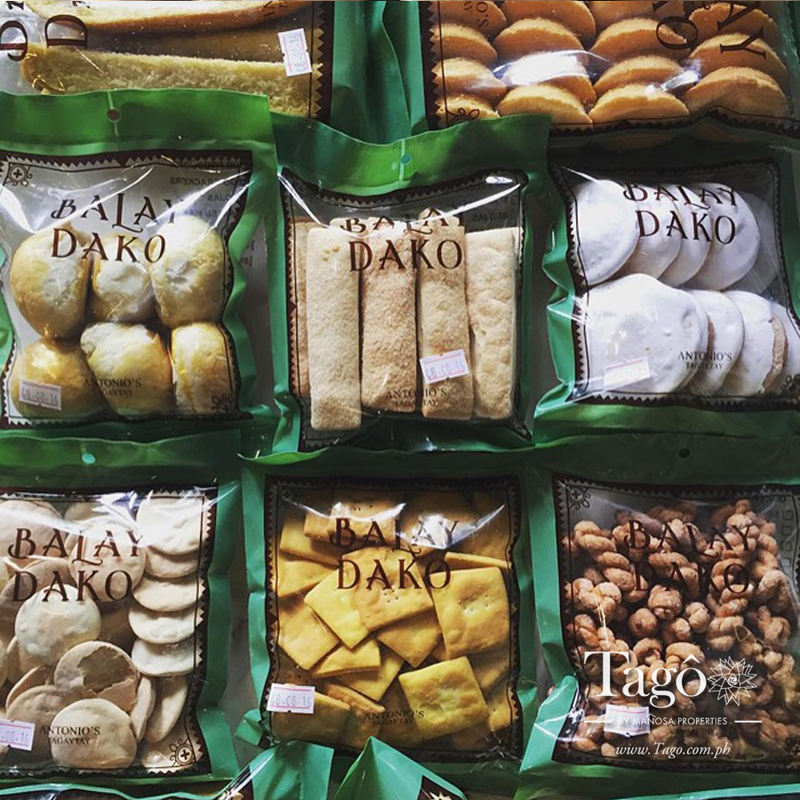 All those local Filipino biscuits you’ve loved, and more you probably haven’t heard of yet– the pasalubong shop at Balay Dako has all sorts of treats for you and your sweet tooth! 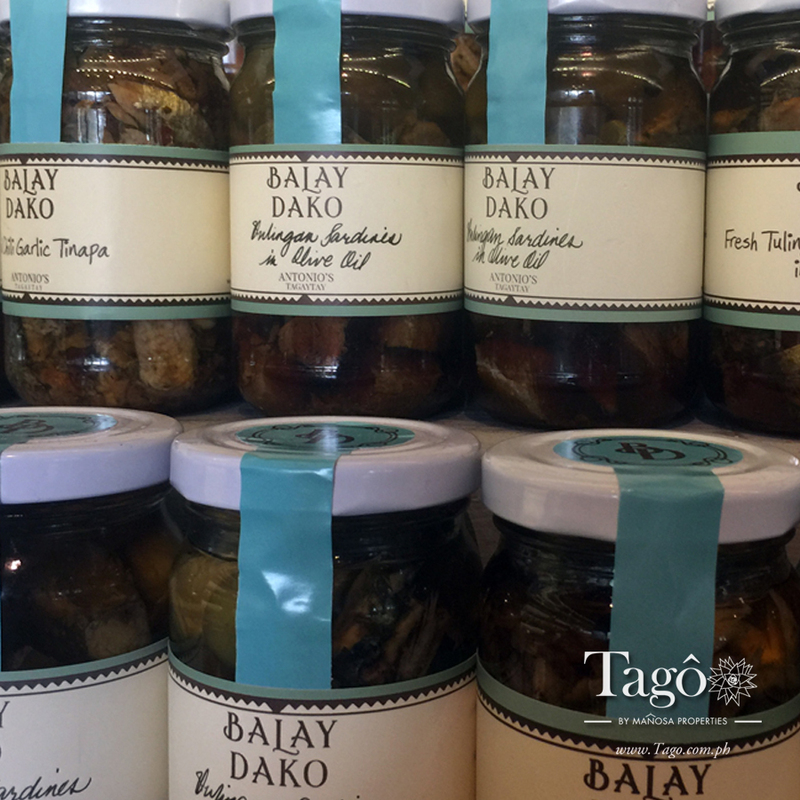 Another Tagaytay favorite: the gourmet sardines, tinapa, and tuyo over at Balay Dako. While you can get score some awesome pasalubong at any one of the restaurants under the Antonio’s group, the most accessible shops would be either at Breakfast at Antonio’s or at Balay Dako, both just conveniently along the Tagaytay-Nasugbu Highway. Visit the website of the Antonio’s group of restaurants. Known for its apiaries, The Ilog Maria Honeybee Farm is another Tagaytay establishment that promotes health and healing. Visitors come by for farm tours to learn more about bees and organic farming, and more often than not, they’d take home with them some of the personal care products made of honey and/or propolis. 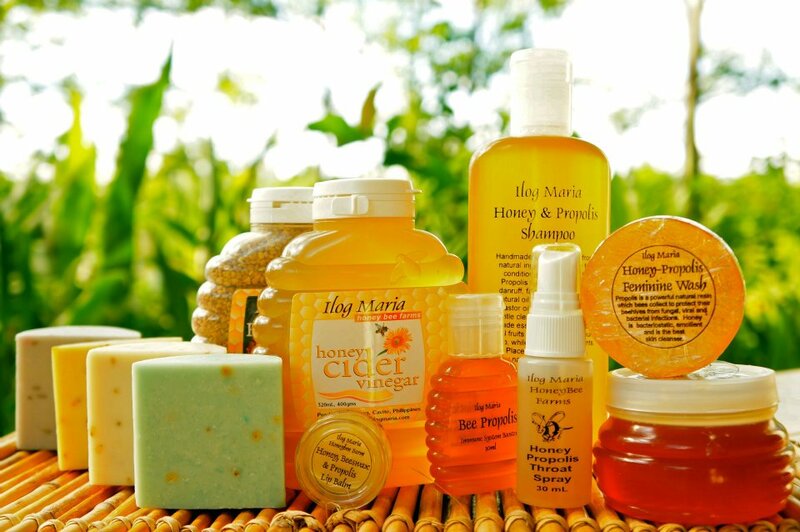 While other health/wellness establishments have already started carrying Ilog Maria products, we suggest you head on over to the main branch for a full selection of available bee products. Head out of Tagaytay City towards Silang on the Aguinaldo Highway, and you’ll find signages leading to Ilog Maria on your right side less than 5 minutes away from the Tagaytay Rotunda. Visit the Ilog Maria Honeybee Farms official website. 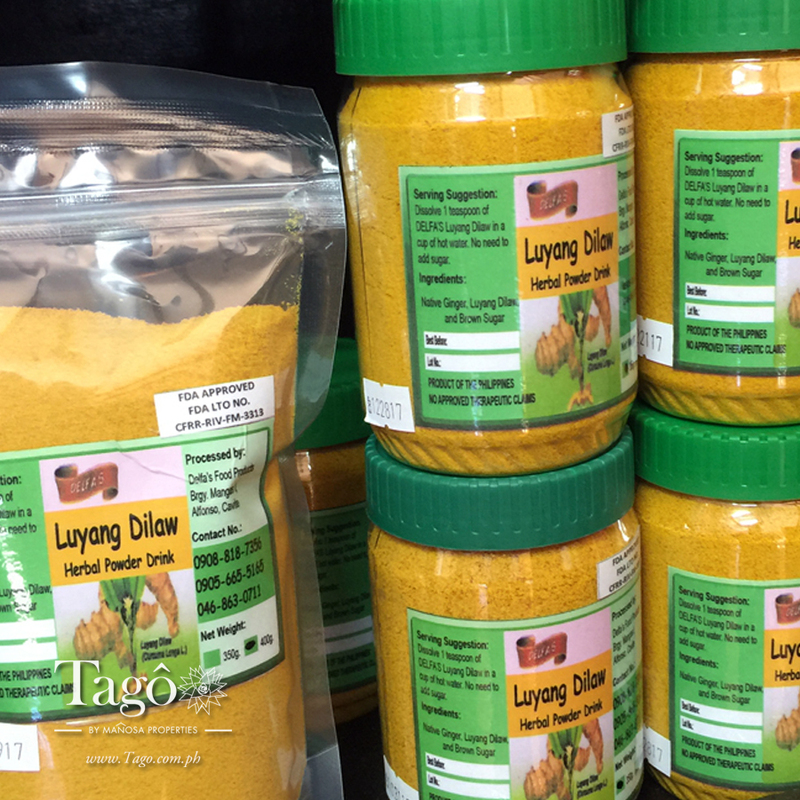 Delfa’s carries a whole lot of good stuff– from the tsokolate Alfonso, to pickled papaya, coco jam, and pastillas– but its signature product is the seven-in-one turmeric tea powder drink. Recognized as a superfood, turmeric does have a number of medicinal properties. So no surprise that a lot of our balikbayan friends hoard up on packs or bottles of these to take back with them abroad. Delfa’s signature turmeric tea drink, made of locally-grown yellow ginger. Delfa’s seems to be doing a great job getting its goods all over the place, as just about any pasalubong shop in Tagaytay carries a number of Delfa’s brands, including the popular seven-in-one turmeric tea powder drink. Feel free to stop by the main branch over at Alfonso, Cavite though, especially if you have plans of buying lots of product.  Visit the official Delfa’s website. Arguably the most well-known Tagaytay brand when it comes to pasalubong is Rowena’s. Case in point: each weekend, you’ll see a steady throng of people coming into the shop along the Tagaytay-Sta. Rosa Road, and coming out with bags and boxes of goodies to take home. 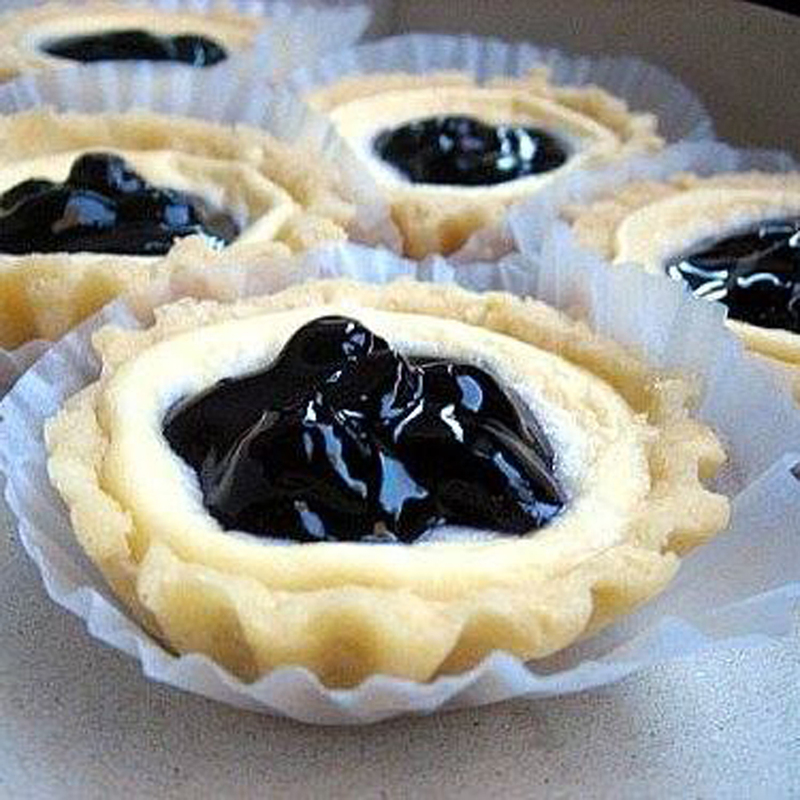 The most sought-after item at Rowena’s: the tarts. There’s a whole variety of flavors– blueberry cheesecake, strawberry cheesecake, mango, buko, and ube. Also popular are their sylvannas, and their French macarons. Of all the tarts available at Rowena’s, some consider the blueberry cheese tarts to be the tastiest. Photo from Rowena’s. You can find Rowena’s main branch along the Tagaytay-Sta. Rosa Road, on the right side, heading back to Manila. Of course, this is probably the busiest branch as well. Consider stopping by one of the satellite outlets at Cliffhouse, Summit Ridge Hotel, and that lot with Carlo’s Pizza and Mile-Hi Diner. Visit the official Rowena’s website. Looking For More Pasalubong Ideas? 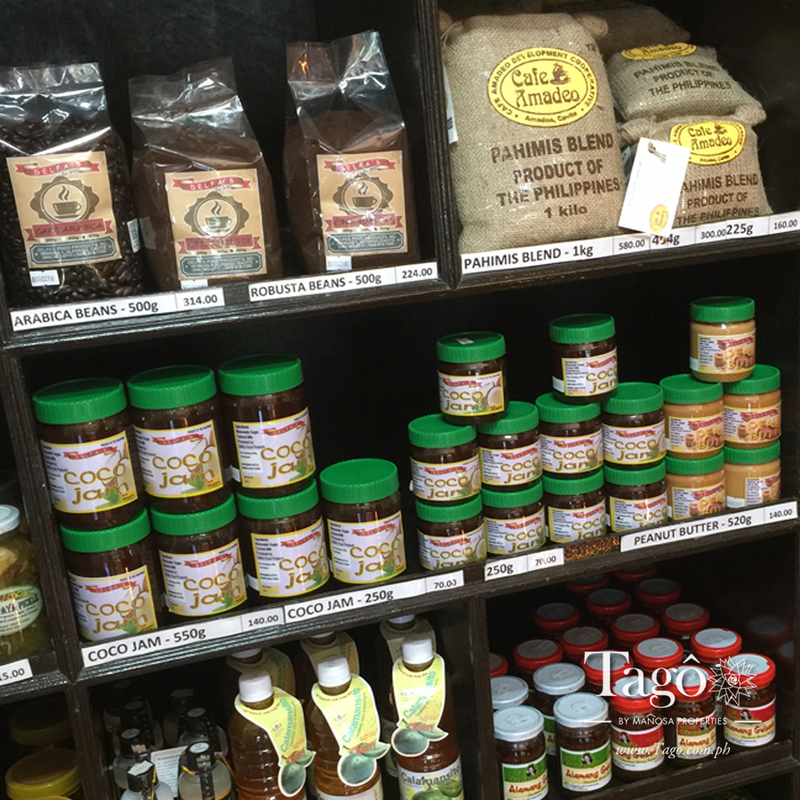 We know we haven’t covered everything you can take home as pasalubong from Tagaytay, as there are a lot of great establishments around the neighborhood. Rest assured, we’ll be taking on a few more ideas in upcoming blog posts. Got a brand in mind that should have made our “7 Most Popular Tagaytay Pasalubong Ideas”? Leave your thoughts and recommendations by leaving a comment below.  Feel free to share this post with your friends as well! Posted in Blog and tagged Antonio's, Bag of Beans, Delfa's, Ilog Maria Honeybee Farm, Mahogany Market, pasalubong, pasalubong from Tagaytay, Rowena's, Sonya's Garden.